I’m becoming a bit of a magpie when it comes to pens, pencils and sketchbooks. I’ve written before about some of the materials I use when I’m doodling or sketching – but that list is probably in need of an update. I was in Germany for New Year, which gave me the opportunity (as I’d forgotten a bunch of my pens) to buy a few new implements. I treated myself to a Lamy ‘Scribble’ mechanical pencil, not cheap, but really lovely to hold. Chunky and weighty it’s a lovely thing. While in Germany (specifically at Papier Haas in Freudenstadt) I picked up some little coloured Stabilo fineliners. I hadn’t seen them before but they’re great. Lovely, fine, even line, good range of colours. I grabbed a few different greys and some bright oranges and greens. The pale grey is a brilliant pen to draw with, almost like using a pencil – so great for rough sketches that you can then refine with a black ink. 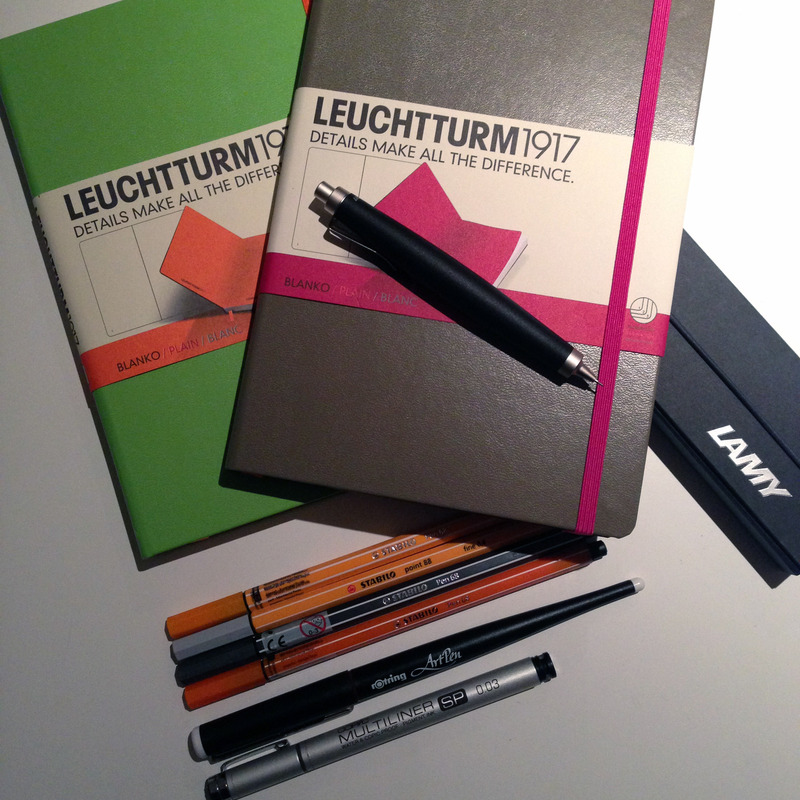 While I was away I saw an ad for Leuchtturm sketchbooks. I didn’t manage to get one at the time but ordered a couple when I got home. They are gorgeous. They come in contrasting colours – cover one colour, band in a contrasting colour. The pages are a little thinner than my usual Moleskines, but smoother and whiter. I’m looking forward to using them. A little while ago I got a Rotring Artpen but hadn’t used it much until the last couple of days. It’s a really smooth pen, but I can’t (although some people might) manage to get much variance of line with it. So for me it kind of suits very loose, gestural sketches. The Copic Multiliner at the bottom of the picture is a really great pigment liner. It’s super fine with just a 0.03mm nib, so it’s capable of adding incredible detail. It’s one of my favourite pens right now. I owe John Evelyn some thanks for recommending that to me. I love getting new pens and sketchbooks – but really, it doesn’t matter too much. Draw whenever you can, with whatever’s to hand. Some of my best sketches lately have been done with a biro on a post-it note! I think you can get everything on that blog post either from Tiger Pens (fantastic online store) or from Amazon.